In simple terms our mission is to tell the story in the optimum format for each event, product or brand’s objectives and the audience we are seeking to attract and inspire. The first step is to identify the message and video concept required and then develop an exceptional storyboard. If you have specific business goals, we will make sure the video achieves these. Footage of a sports event is more than the story of the highs of winning and lows of not. Around the racing core, there are a myriad other stories; athletes, technology, physical demands, training and nutrition, venues, spectators – which can produce many features for broad appeal. Enthralling footage is fascinating and compelling viewing for a diverse audience, from youth to the mature viewer, expert to recreational fan. Music, narrative, audio and graphics are all also key strategies in telling the story, and we work with some of the best talents and creative specialists. Our state-of-the-art cameras, whether shooting from a fixed position or in motion on balloons/blimps, remote controlled helicopters (drones), vehicle or out on the water, ensure we capture the best shots. Shooting close up, ten feet away or pulling out to panoramic, our team will have the best selection of equipment available. Putting precision in our hands, 3-axis stabilization guarantees super stable images, regardless of the environment, terrain and distance of filming. We work with our clients to evaluate each event and develop a production format that will optimize your goals. The length of a video should only be as long as needed to make your point, and depending on use, for example whether for Social Media, Youtube or TV Shows inclusion. There is not one correct length for a video and we will work with you to identify the optimum duration. Thriving through excellence is our team’s goal. We pride ourselves on our attention to detail and ability to deliver over and above our clients’ expectations. Flexibility is key in our repertoire. We understand a brief and requirements may change, and are quickly able to respond to this. 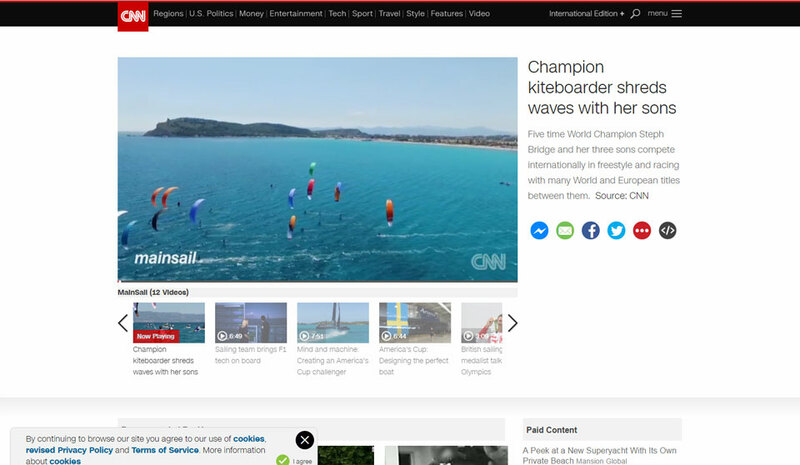 Give viewers a unique insight into a sport, its athletes and chronicle the inner workings of the physical and mental demands to perform.Our programming includes, TAKLIMAKAN RALLY, TUAREG RALLYE, E-BIKE CHALLENGE, 4DESERTS RACE SERIES, SHANGHAI INTERNATIONAL MARATHON, PANERAI CLASSIC YACHTS CHALLENGE, RESOLUTE CUP and more. Ready to broadcast news with delivery via satellite and FTP server within 3-4 hours after an event. Our sports properties are channeled into our standalone flagship TV Shows and magazines, including GC32 Racing Tour, Inside Sailing, Fleet Racing Tour, Kite Masters,PURE ACTION,GEARING UP and The Outdoor Sports Show. Ready-to-broadcast reports available in various lengths with voice over script in required languages. Sport is fast-paced, unpredictable and high-octane. Our highlights shows present the best of each event, building drama, providing context to the action and combining engaging story telling with creative footage. They are essential marketing tools for any company, providing a showcase for services, products, brand or other aspect of your business. We provide cost effective and unique videos which will make you stand out, engage your audience and maximise return on investment. There’s little doubt that the integration of video into social has massive potential. Integrating video content across social media platforms is vital to build audience and profile. We provide a range of solutions for both catch-up and live onto social media platforms. Our live streaming technology allows real time event broadcast, data tracking and commentary to thousands of fans, without time lags and distortion. Our host broadcast services provide live TV coverage to broadcasters around the world. We understand the challenges in producing live, particularly regarding the presentation style, content, digital interaction and technical delivery challenges. Get a new perspective of the action with 360° coverage. This very unique “experience” films a complete panoramic of what an athlete can see, enabling viewers to immerse themselves in a virtually first-hand experience. We advise rights holders on ways to maximize the value of their assets through distribution of their video content. Media distribution is the connection between client (event, business, sponsor, organizer) and the customer. The internet has expanded how viewers consume content, enabling them to watch what they want, when they want and where they want. Digital strategies are central to distribution, and ICARUS Sports’ integrated approach helps our clients navigate the intricacies of traditional broadcast, interactive and online channels. Working alongside our Production team, our Distribution team provides a seamless solution for both rights holders and broadcasters worldwide. ICARUS Sports has developed a personal relationship with the vast majority of broadcasters worldwide, and it is this relationship which enables us to work with events and maximise the return on investment to our clients. Whether with rights-holders or representatives of rights-holders, our team has the expertise to enhance existing relationships and establish new ones. We are renowned as a reliable service provider. Strategic relationships with distribution partners such as Bloomberg TV, Fox Sports and TENCENT have enabled ICARUS Sports to expand our distribution to an ever growing and influential demographic across Europe, Asia, the Middle East and the Americas. We use our own in-house client database to manage distribution, allowing a variety of information to be managed and presented to agencies, rights holders or operational control rooms. Our integrated planning will create maximum exposure for your event/product/brand whilst maintaining the value and exclusive nature of content across multiple broadcast mediums, including TV platform, digital media, Video On Demand and in-flight entertainment. ICARUS Sports specialized marketing team creates a detailed media report that includes all TV airings from the broadcasters that use highlights, as well as TV shows inclusions and online media appearances. Therefore, our clients can easily demonstrate to their sponsors and commercial partners the benefits of such an extensive media exposure. Every brand has a business interest. ICARUS Sports offers cost effective branding and positioning within outdoor sports in fast growing markets. We manage the global media and commercial rights for numerous sports events, providing strategic advice and sponsorship activation programmes, connecting international brands with a high end sports audience. Distinguishing your brand from its competitors and standing out in the business world and over the years we have helped several brands become leaders in their market. Whether you want to promote an existing product, give it a new identity or develop a new production, our expert team will have a range of innovative and sustainable concepts to inspire. Promote your Brand – we can advise you how to promote your brand and leverage media opportunities to bring your brand to the forefront. Promotional Videos – are essential marketing tools for any company, providing a showcase for services, products, brand or other aspect of your business. We provide cost effective and unique videos which will make you stand out, engage your audience and maximise return on investment. Brand Inclusion on TV Shows – we offer brand positioning on our TV Shows to help build effective communication, whether subtle inclusion or bold statement, to attract and inform the consumer.